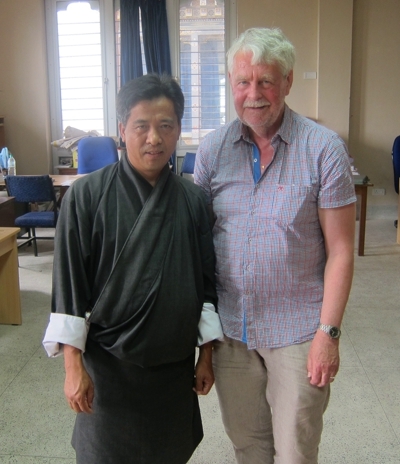 During the period 5-12 May 2017, the NSAN editor Lars Eklund visited Bhutan on invitation from the Royal University of Bhutan (RUB) and more specifically by its College of Education in Samtse (SCE). The planning for the visit originated in Lars meeting Swedish musicologist Johan Westman – with a degree from University of Bergen, Norway, in Kolkata in January 2017. Johan works since 2016 at SCE on contract as music teacher, being most appreciated by the management headed by the President (Rector) Dorji Thinley. 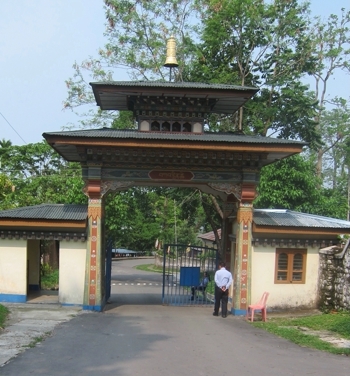 Samtse College of Education is one of eight Bhutanese colleges at different locations in the country, under the umbrella of RUB. It was established already in 1968 as the Teachers Training Institute, became part of RUB in 2003 and received its current name in 2005. It still focuses on teachers training, offering Bachelors and postgraduate diploma courses in Education, but also a Masters programme in Contemplative Counselling Psychology. Currently SCE plans for Masters programmes also in Science and Mathematics, and hopefully a PhD programme will be introduced before 2020. SCE hosts seven centres, the Centre for Educational Innovation and Professional Practice (CEIPP); the Centre for Contemplative Counselling Education and Research (CCCER); the Centre for Innovation in Mathematics and IT Education (CIMITE); the Centre for Language Education and Research (CLER); the Centre for Innovation in Science Education and Research (CISER); the Centre for Social Science and Humanities Education and Research (CSSHER); and finally the Lu-Rig Centre for Music Education and Research – which is Johan Westman’s work place. Currently SCE has external linkages with a number of European, American and Australian universities, including TERI University in Delhi and Aalborg University in Denmark, but till now no Swedish universities. Lars was invited to hold a seminar on Swedish research collaboration with South Asia, naturally with a special focus on Bhutan. The idea was to get an idea of which common research fields exist and with Lars expertise find out possible collaboration partners and institutions. 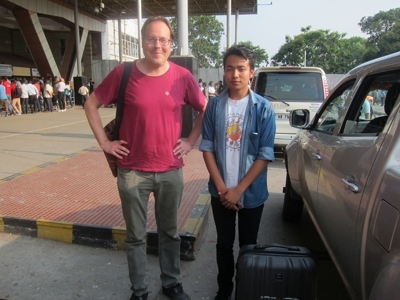 Arriving by flight from Delhi to Bagdogra airport near Siliguri in northern part of the Indian state of West Bengal, Lars was picked up by Johan Westman and Norbu Tshering, a student of his (on photo) in the late afternoon of Friday 5 May, and then travelled by car four hours, crossing the Teesta River and arriving at the Bhutanese border on the other side of is Samtse. A small picturesque town most well-known for being the home of Bhutan’s fruit juice and marmelade industry, besides hosting the SCE Campus. Since the border gate close at 8 PM and we arrived later than that, it was only possible to clear the Indian border procedures, whereas we had to return a few days later – after the weekend -to the Bhutanese check-post in order to get the Bhutanese visa stamped in the passport. After a quick installation at the excellent well-maintained SCE guest house, a welcome ceremony was prepared, the President Dorji Thinley and some of the faculty members had waited patiently for us even though our arrival was delayed. The President said that they looked forward that my visit should result in creating more Nordic connections besides the very fruitful collaboration already existing with Aalborg University. The following morning was time for my presentation. After being introduced by the Dean of Research Dr. Sonam Rinchen, I gave an overview of important research fields common to Sweden and Bhutan, presented information about Nordic PhD theses and Swedish research projects related to Bhutan – mostly within natural and agricultural sciences, gave concrete suggestions regarding specific Swedish university institutions in the fields of social science and humanities that might be of interest for SCE, and finally listed all the Erasmus Mundus Asia Regional projects from 2008 till 2015 that have included Royal University of Bhutan. Among the approximately 10 such projects, one consortium was actually coordinated by Aalborg University, Denmark, and another by Mälardalen University in Västerås, Sweden. Other projects have included Uppsala University, Sweden, and Turku University, Finland as consortium members. The seminar was attended by approximately 15 professors and 40 students. The latter were mostly teachers training students having music classes with Johan, and as a surprise happening before Lars started his presentation, the students sang a Swedish song “Vem kan segla förutan vind” in Swedish language, accompanied by Johan and other students on violins and guitars. The presentation was much appreciated and was followed by a Q&A session where the professors commented what they found to be interesting, but left concrete questions regarding proposed research projects to the number of meetings with the various centres that Johan had prepared for during Saturday afternoon plus in the following week on Monday and Tuesday, before Lars and Johan were supposed to travel to the capital Thimphu on Wednesday. In the evening, a personal meeting was held with Johan and Dr. Purna Subba, professor in Mathematics at SCE. Photo to the right. Purna had an interesting proposal for a project within the field of ethno-mathematics to present for Lars, a project that may also include researchers from a university in Malaysia, and hopefully also a Swedish partner institution. Lars immediately suggested a suitable Swedish Mathematics department, contacted people he knew there and within few days got a positive response from a researcher interested to join the project. More information will follow. The following day, on Sunday, Dr. Subba organised a tour by car around Samtse, visiting the Sunday vegetabe market, and then up the mountain along a new road that later this year will connect Samtse with Thimphu and Paro in central Bhutan (till now travel from Samtse to Thimphu has to be done by crossing the border and drive on the Indian side to Jaigaon/Phuntsholing for another border crossing to Bhutan – which in turn means the need for double entry visa if one wishes to ciist both Samtse and Thimphu). 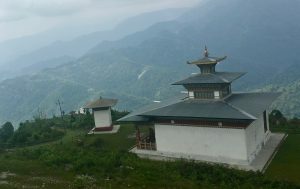 At a most beautiful viewpoint place along the road, on 1,350 metres height, we stopped for a picnic in the fresh air. Going down again to Samtse town we then visited a farm where biogas from cow dung is used to make the household independent of buying cooking gas. A smart easy solution for a sustainable future. 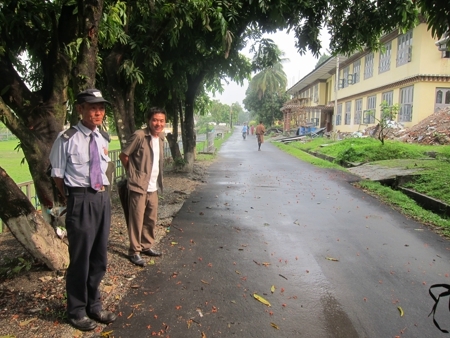 CONTINUE READING LARS REPORT FROM SCE IN SAMTSE, including more photos, as a pdf-file!